Congratulations to Leo Ostenrath winning the Oldenburg 2017 Fight Night, a 250 level event, beating Matty Schneider in a very close final 5 points to 4. This is Leo's third tournament win in the last 52 weeks, and his victory over Matty is his fifth win vs a top 10 players. Matty has had three second place finishes since the EJC last year, plus a third place in Herxheim and a win at the British Juggling Convention. He's now climbed up to 5th in FNC Current 52 Week rankings and puts him even further ahead in first place in the 2017 Race Rankings which reflect only results this year. 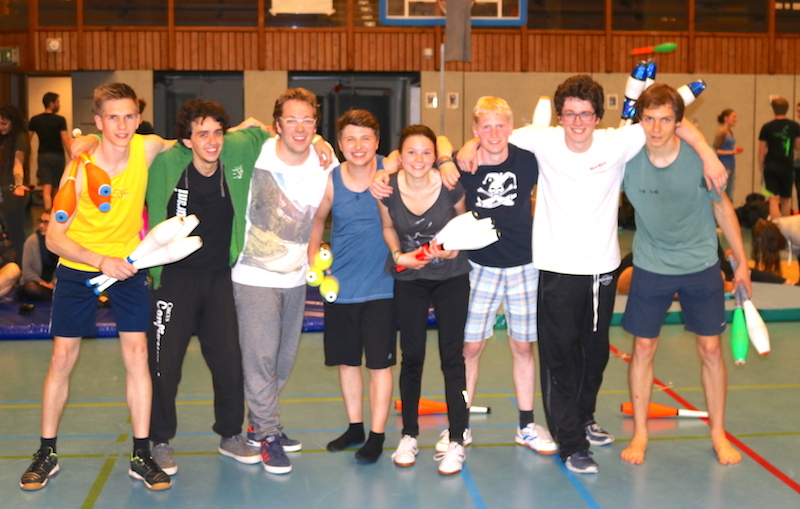 12 jugglers took part in the Fight Night at the "DinOLsaurier Jonglierconvention" with eight in the knockout. Isabell Stroben came third, her best result at a Fight Night so far, beating Stephan Cipra in the round of 8 and Victor Lehr in the third place match. This coming weekend there are Fight Nights at Bungay Balls Up, worth 250 rankings points, and at the Nederlands Jongleer Festival, the second Major 750 tournament of the year.